Editor’s note: Bill Nye will be available for interviews in advance of his visit to Colorado Springs. To request an interview, contact Mitch Karstens, (719) 255-3540 or Tom Hutton, (719) 255-3439. COLORADO SPRINGS, Colo. — A public television icon who brought science into the living rooms of millions will celebrate the academic success of University of Colorado Colorado Springs students and give a campus-wide address April 4 at the Gallogly Event Center. 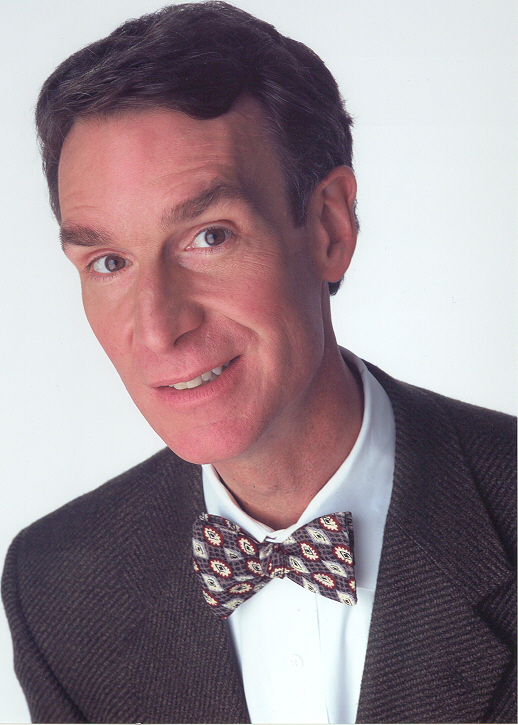 Bill Nye, the quirky, bow-tie wearing star of the PBS hit “Bill Nye the Science Guy” will speak at 7 p.m. in a presentation open to all UCCS students, faculty, staff and community members. Tickets for the event go on sale March 1 and will be available at King Soopers, Tickets West and the University Center front desk. Tickets are $3 for UCCS students and $7 for all others. Earlier, Nye will meet UCCS students who live on campus and who earned a 3.2 (B-plus) or better grade point average for the fall semester. More than 150 students will receive a free dinner and have an opportunity to meet Nye in addition to receiving free tickets to his speech. Karstens said Nye’s presentation will be sophisticated and intended for a college audience, though he expects elements of Nye’s old PBS show to find their way into the lecture. An engineer, comedian, author, and inventor, Nye’s primary goal is to foster a scientifically literate society. He makes science entertaining and accessible, often using humor. As a high school student in Washington, D.C., he tutored others in math and became an avid bicyclist. Later, he earned a degree in mechanical engineering from Cornell University and a job at Boeing in Seattle where he helped design parts for 747 airliners. Nye is the host of three currently-running television series. “The 100 Greatest Discoveries” airs on the Science Channel. “The Eyes of Nye” airs on PBS stations across the country. His latest project is hosting “Stuff Happens,” a show about environmentally responsible choices that consumers can make. Nye is also executive director of The Planetary Society, the world’s largest space-interest group. He recently spoke on behalf of the society at the International Astronautical Federation Congress in Glasgow, Scotland. He has also spoken in Hyderabad, India and Beijing, China, in addition to delivering commencement addresses at the University of California, Santa Barbara, Rensselaer Polytechnic Institute, Johns Hopkins University, Harvey Mudd College, and California Technical University. Nye holds two patents on educational products, a magnifier made of water and an abacus that does arithmetic like a computer. An occasional athlete, he also has a patent pending on a device to help people learn to throw a baseball. His next patent is an improved toe shoe for ballerinas. Nye’s visit to UCCS was made possible by support from the Office of Student Activities and the Auxiliary Services Departments. For more information about UCCS student activities, visit http://www.uccs.edu/osa/bill-nye.html. UCCS, located on Austin Bluffs Parkway in Colorado Springs, is one of the fastest growing universities in the nation. The University offers 36 bachelor’s degrees, 19 master’s, and five doctoral degrees. The campus enrolls about 9,300 students annually.